Emerging Markets and Developed Markets (Ex-US): Setting Up for an Attractive Entry Point ? One of the classic scenes from BraveHeart was when Mel Gibson, playing William Wallace, was standing in the field facing down the English cavalry, and holding back his troops, yells, “Hold!…Hold!…Hold!” waiting until the heavy horses and opposition were nearly right on top of them, before unleashing his armaments. Using that scene as a metaphor for timing an asset-class entry or exiting a market is a tough task, as most investors know, and prone to being very wrong, therefore for clients, I like to add or subtract to sector or asset class weightings gradually and not make big bets. The weakness in Emerging Markets this year after the monster run off the Q1 ’16 lows where the 10-year rolling return for EM’s was negative, presents opportunity in my opinion. The question remains though, how much downside is left in the asset class ? These two charts from The Daily Shot (@soberlook) indicate that there could be more pain ahead for the asset class given US dollar strength. 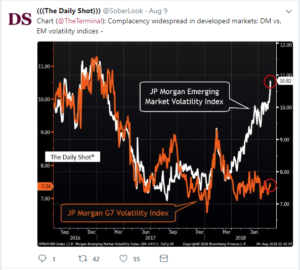 When Chris Varrone of Strategas came through Chicago two weeks ago (Chris is an excellent technician) he made the offhand comment at the lunch Strategas held, that Emerging Market’s have become Tech index proxies and he was right. Despite the outperformance in the Sp 500’s Tech sector YTD in 2018 +14%, the EM ETF’s like the EEM and VWO are down this year -4.50% and 7% respectively even though the Top 5 holdings of both the popular ETF’s are Chinese or South Korean Technology companies. Looking across the globe, the SP 500 looks to be the only game in town right now, but investors are paid to think ahead and evaluate risk/reward. The weekly Bespoke Report had an interesting chart (not shown) this weekend: given the US dollar strength (and the US dollar is not even at a 52-week high yet) the SP 500 “Domestic” companies have started to outperform, versus the SP 500 “International” companies. The Domestic companies are defined as SP 500 components with more than 90% of their revenue from the US, and that would include utilities, retailers, more mid-cap banks, etc. For clients, Trinity made the first emerging markets investments in Q1, 2016 (see this link here and please excuse typo’s) but the problem was the weighting initially given the asset class, was depending on the type of account just 3% to 5% or 3% to 6% of the account since the volatility and the trend in the EM’s was still lower. Obviously, in hindsight, i wish that EM weighting would have been greater given 2017’s return for emerging market equity, but this was a longer-term allocation to the asset class, and it is the conditions that present themselves today that have me writing this post. According to State Street Global Advisors (SSGA) who came through Chicago a few months back, Emerging Markets are roughly 15% – 16% of total global GDP growth. It would be tough for me to lift the current EM weighting to 15% of client accounts all at once, as much due to the fact that I believe the US stock market, i.e. the SP 500 is in a secular bull market and despite the fact a good flush is needed, the bull market has a ways to go. US dollar strength is the key for the rest of 2018, and that could hinge interest rates and the US midterm elections in 2018. I am old enough to remember what the dollar did from 1983 to 1985 under President Reagan, which the primary victim was “the Rust Belt” in midwestern US. President Trump’s policies are very “pro-business” and pro American capital, so as was written here in January, ’18, the fact that the dollar hasn’t been stronger has been the puzzle. To conclude, clients EM weighting will likely be lifted again in the next few months, depending on the markets and what the dollar does, but the bias is to be adding to EM’s over the next few months, than be a seller. Those long-term returns are tempting for the asset class. Again, as a fresh-faced, not terribly-bright kid with a newly-minted Finance degree in 1982, at that time The Cold War was still in full swing and the Eastern Bloc in Europe was firmly socialist / communist, and Latin American Banana Republic’s swung back-and-forth from liberation theology to quasi-socialist / capitalist economic models. The exact stats could not be found, but I read years ago where 60% of the globe (in terms of country’s stated form of government) was Communist / socialist in the mid-1980’s, versus the 10% today ? The last 5 remaining Communist countries are China, North Vietnam, Laos, North Korea and Venezuela. And saying all that, we would then have a debate about how many of the countries either listed or not listed are true democracies with capitalist economies, and how many adapt some form of socialism, etc., etc. 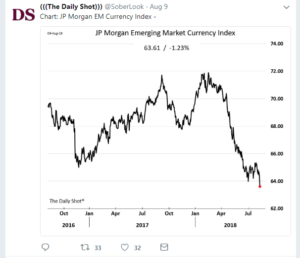 Here was an interesting tweet this week from Gary Morrow (@garysmorrow), which ultimately may make the best case for the Emerging Market economies. The world is getting to be a better place, as hard as that may be to tell, from the headlines. The difficulty at this point is finding funds or ETF’s that are not holding all the same names. The majority of Emerging Market’s positions are the EEM and VWO, but we will complement the ETF’s with some active management as time goes on. Thank you for the analysis. It is interesting that in the group of 5 nominally communist economies, the largest and by far most important — China — is no longer exactly a communist economy (as opposed to its political system). They have found the tremendously effective method of providing strong general directive and guidance from above while utilizing the creativity and efficiency of capitalist deployment of capital and competition at the operational level. There is some partial resemblance to how the US operated in the second half of the 20th century.